Sometimes, if you're very lucky and the wind blows sweetly from the East, a random show on a Wednesday will surprise and delight. It's just the thing to bridge the weekly slump, and blow your smile right on through to the weekend. The Tank is bursting with these kinds of performances, and Necromancers of the Public Domain is among the finest. 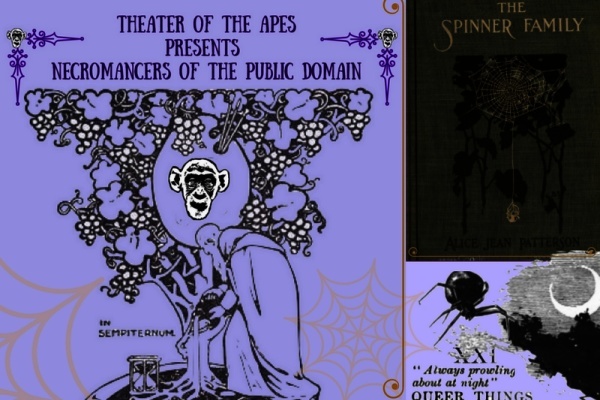 In this whimsical, comedic, and inoffensively low-budget show, Theater of the Apes digs up an obscure text from the New York Society Library. At least, one that's published in 1923 or earlier (copyright laws, yuck. They're muddy at best). Performers of all stripes interpret the text, some landing close between its pages, others rocketing quite far away. In this week's installment, they all focused on spiders. "Gross," you might think, "Spiders are creepy and should be squashed at all costs." "They crawl into your mouth at night when you're sleeping," the rumor goes. "Whatever," you admonish. "As long as they don't bother me, I won't bother them." In truth, dear reader, I think you should give spiders another look. Put yourself in the shoes of Alice Jean Patterson, an early 1900s naturalist (about whom almost no information exists on the Internet). "All of Nature's children are interesting," she argues, "and the spiders are by no means the least interesting among them all." Despite their small stature, Patterson succeeds in weaving entire worlds for these little Spinners, and grants them names and personalities akin to A.A. Milne's Hundred Acre Wood - but in our own backyard instead of Christopher Robins'. Mrs. Epeira vulgaris, also known as a common garden spider, "uses her feet to help her hold her food up to her mouth while she eats her dinner, for you know she has no fingers with which to hold it." Stop it, Mrs. Patterson, that's simply too cute! Where are the gruesome fangs, the troubling nest of legs, and the extremely disturbing pairs of eyes? Gone in a minute. Instead, this naturalist's writing is compassionate and curious, brilliantly laced with wit and anthropomorphic detail. It's a rare and lovely find. The performers interpreted it in their own charming ways as well, with works as varied as a slow guitar lilt and a bizarre audience-participation song counting to 8. The most heartwrenching was a solitary spider made of basic construction materials and an orb of light for its body, sitting on your porch and counting up things it thinks about during the night. Read so slowly by a man's silhouette inside the house that the words dripped like maple syrup. It's a delightful premise for performance art, framing each vignette around a common theme that's literary in nature! Adorable. This approach also leads to deep philosophical questions about interpretation and individualism. 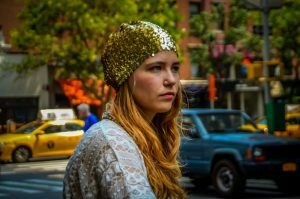 Is there such a thing as true writing? How do different people interpret the same book? Even if we're not making art about the words, it's worth considering how others may read your work, and what they may weave from the pages. If you're lucky, they just might make something delightful. And at worst, at least you haven't been forgotten. Volunteering at The Tank is the best gig in town. Sell beers and wine for a few hours, then pop in to see a show. All in support of an amazing theater that's a home for emerging artists.